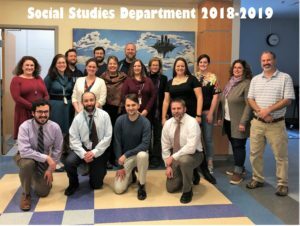 The Social Studies Department at Yorktown High School consists of 21 dedicated and knowledgeable teachers. Eleven members of the department have achieved National Board Teacher Certification. We offer a variety of required and elective courses to meet the needs and interests of all students. Our philosophy is that social studies prepares students to become critical thinkers, writers and problem solvers, enhancing their knowledge of our changing world and global economy. We believe that social studies is vital for becoming good citizens and we teach our various courses by emphasizing not just content, but also skills that prepare all students to be successful beyond their high school career.